Information is everything and everything is information. As world renowned physicist John Archibald Wheeler poetically puts it: “it from bit,” meaning every “it,” that is, “every particle, every field of force, even the space-time continuum itself, derives its way of action and its very existence entirely, even if in some contexts indirectly, from the detector-elicited answers to yes or no questions, binary choices, bits.” What Wheeler means here is that “all things physical, all its, must in the end submit to an information-theoretic description” (Wheeler). In other words: everything is information. 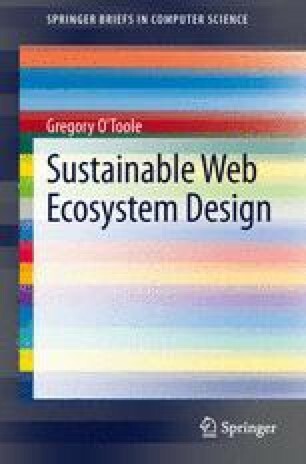 It is not easy to put the ideas of this book, that is, the ideas describing the anatomy of sustainable Web ecosystem design, into a neat and clean box. In fact, I am not sure it is even possible. We know that this is the case because what we are really talking about here is organizing, indexing, and making it fun and efficient to access information. As we know, information is everything, everywhere, all of the time. At this point in human evolution it is not unlike a fish trying to understand water. Quite frankly, that is a tough idea to get your head around. Further, we are not simply trying to understand that information is everything, everywhere, but we are trying to go a step further and become information’s master manipulator. At will, no less. Then put it onto devices, many different kinds of devices, and make it accessible to billions of people across countries, languages, ages, backgrounds and abilities. We want to make information work well for us. We want to make it sustainable over time. In all, what we face is no small task. That is why this book has been written. Essentially what we are talking about is a unified theory on how to create the interface between front end Web design and development methodologies and practices matched with the every day human user. This is a tall order.